This morning I was privy to a conversation in Tesco Express that got me thinking. An older generation lady (for the purposes of this blog, let’s call her Elsie; she looked like an Elsie…or maybe a Hilda) was ranting (entirely good-naturedly) to the slightly bewildered cashier, about what the world was coming to, after said cashier informed her that they didn’t sell raisins, sultanas and dried fruit peel. No prizes for guessing what Elsie’s making. Other customers gazed in bewilderment at this rare sighting of an actual real-life hot-cross- bun-maker. So, Rumblechatters, where do you sit in the make-your-own versus buy-them-in debate? And are you well informed as to the origin of this yummy food tradition? 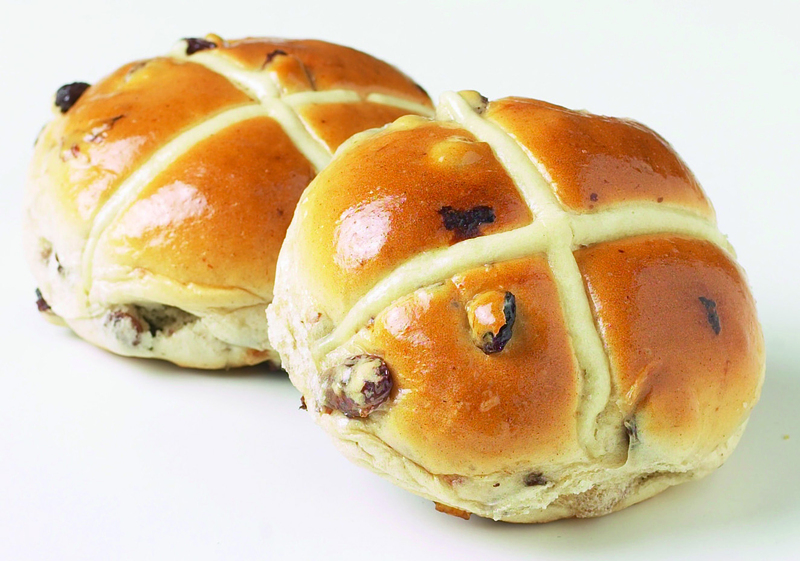 I’d always blithely assumed that the origin of the hot cross bun was fairly clear cut – a Christian tradition celebrating the end of lent, utilising lots of tasty, forbidden by lent ingredients to make a yummy cake/bread cross-breed, stamped with the cross of crucifixion. In my head this was going to be a quick one – bit of history, bit of religion…job done. But no my friends, it appears that there is far more to the humble hot cross bun than meets the eye. Did you know, for example, that way before the Christians staked their claim to the HCB, Pagans were merrily worshipping their goddess Eostre (after whom Easter was named), by serving up tiny, fruity, cakes, often decorated with a cross at their annual spring festivals. The English word ‘bun’ evolved from the Greek ‘boun’, which was used to describe a ceremonial cake of circular or crescent shape, made of flour and honey and offered as a periodical thank you to the gods. So, given that the humble HCB is not actually that humble, imbibed as it is in a steep tradition of religion, history and culture, should more of us take a leaf out of Elsie’s book and get Good-Friday-Baking…or is this just another example of a time-consuming tradition best circumnavigated the modern way – by buying one and getting one free in a supermarket? Don’t even get me started on the Easter Bunny!